Next-Door Nemeses: Rogen and Byrne have mixed results when they attempt to bond with their new neighbors in Stoller's comedy. When movie comedies rely on characters rather than on shtik, the laughs should be spread around. As a general rule, the more straight men, stereotypes and stock figures a character-based comedy has, the less funny it is. The more characters exhibit specific, believable absurdities, the more the audience laughs. It's a simple principle, but one too rarely applied. In bromance comedies, the female love interests or wives are typically unfunny stick figures. Same for the guys in too many rom coms. In slobs-versus-snobs comedies, the slobs get all the laughs. And so on. 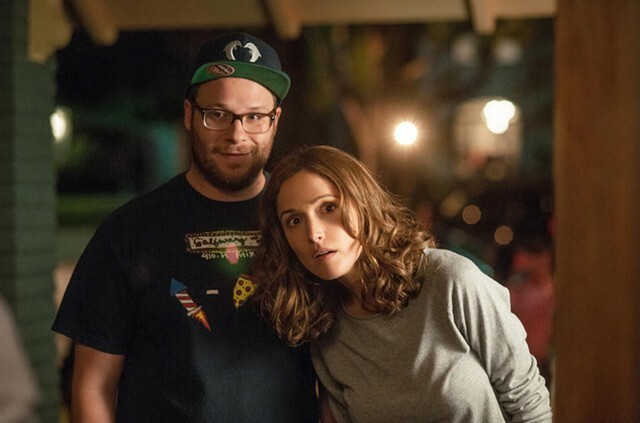 That's why Neighbors, directed by Nicholas Stoller (Forgetting Sarah Marshall), stands out in its genre. The film's unpromising green-band trailer emphasizes the boilerplate differences between yuppie parents Mac and Kelly Radner (Seth Rogen and Rose Byrne) and their nemeses, the rowdy members of Delta Psi Beta, who move next door and upend the couple's tranquil existence. The actual movie is both far cruder — in the raunchy sense — and more nuanced than its ads. Even the snobbiest snobs in Neighbors turn out to be closeted slobs, and it's much funnier as a result. The film's first twist on its timeworn formula is that, despite having a picture-perfect home and an adorable baby (Elise and Zoey Vargas), Mac and Kelly have doubts about this whole "adult" thing. When they first approach the fraternity, they come bearing gifts of weed. Invited inside to party, the responsible parents regress to their college selves in short order, with Mac developing a hopeless man-crush on oiled alpha male Teddy (Zac Efron). It's only when the Radners have to suffer through the din of parties they aren't invited to that they resolve to drive Delta Psi from the neighborhood. The second twist is that, while those parties may be a hedonistic force of nature, the fraternity brothers have doubts of their own. Fretting about his postgraduation prospects, academic slacker Teddy is all the more determined to make college history via his epic bashes, a goal that puts him on a collision course with the Radners. When these not-exactly-opposites clash, the results are sometimes predictable, sometimes creative, but generally pretty hilarious. Mac and Kelly try increasingly dirty tactics, from inciting a friendship-destroying hookup to corrupting a pledge, while Teddy's crew proves equally resourceful. Stoller achieves an adept, Apatow-style balance of physical and verbal comedy while keeping the plot on track. Almost everybody gets laughs, from Rogen (doing stuff we've seen before, but still well), to Efron and Dave Franco as brothers in arms (they have a great exchange riffing on alternatives to the phrase "bros before hos"), to Lisa Kudrow as the PR-obsessed college dean, to Hannibal Buress as a not-so-helpful cop. Most notably, perhaps, Byrne's Kelly gets to be as lewd, crude and funny as the guys. (And I mean crude: If you're not up for jokes about squirting breast milk, steer clear.) In one self-referential exchange, Mac begs Kelly to be the typical film-comedy wife and curb his man-child tendencies: "Haven't you seen any Kevin James movies?" "What if I want to be Kevin James?" she counters. Byrne clearly relishes the chance to be bad, and her character's behavior doesn't come out of nowhere; early on, the script establishes that Kelly is going stir crazy as a stay-at-home mom. Basically, everybody in Neighbors needs to grow up. That's an ominous theme if you insist on doing sociological analyses of the movie or wondering who's watching the baby in any given scene, and an excellent one if you don't. Like the wild party that Mac and Kelly didn't intend to enjoy so much, the film is raucous, resolutely immature and almost never boring. Neighbors is not showing in any theaters in the area.